The internet is great, isn’t it? You can post anything you want on the internet, and if people like the sound of it, they spread it. It doesn’t make any difference if it’s true or not. We’re not born fact checkers and skeptics, are we? Pretty soon, before you know it, it’s gone viral. Then it becomes its own sensation, and people who don’t even believe it start reporting it. Never is this more true than with hoaxes. The latest hoax is the “15 Days of Darkness in November” thing that’s going around. Everyone’s on the bandwagon. It’s here again this year, and will be debunked again, and will probably be here next year, too. Of course, NASA never said any such thing. Here is supposedly what will happen to cause this calamity. Try and follow along with the nonsensical foolishness. During the conjunction between Venus and Jupiter on October 26, light from Venus would cause gases in Jupiter to heat up. The heated gasses will cause a large amount of hydrogen to be released into space. The gases will reach the Sun and trigger a massive explosion on the surface of the star, heating it to 9,000 degrees Kelvin. The heat of the explosion would then cause the Sun to emit a blue color. The dull blue color will last for 15 days during which the Earth will be thrown into darkness. Where to begin? Let’s start with conjunctions. Conjunctions are mostly just visual phenomena. The fact that two things in the sky look closer together from our point of view on Earth doesn’t mean that they’re that close together. In fact, even when Jupiter and Venus are in conjunction, they can still be over 800 million km apart. For perspective, the Sun and the Earth are about 150 million km apart. So, as the hoax goes, at that great distance, light from Venus will cause gases on Jupiter to heat up. News Flash: the light from the Sun is far more intense than light from Venus could ever be, and it doesn’t heat up the gases on Jupiter. In fact, any light from Venus that makes it to Jupiter is just reflected sunlight anyway. The hoax gets more outrageous as it goes along. These supposed heated gases then escape from Jupiter into space, and head for the Sun. But Jupiter is enormous and has enormous gravitational pull. How are any gases going to escape Jupiter’s overpowering gravity? Answer: they can’t and they won’t. Then, these gases supposedly strike the Sun, and trigger a massive explosion on the Sun’s surface, which turn the Sun blue and plunges the Earth into darkness. Not blueness, which I could understand, but darkness. This is absurd, of course. The Sun dominates the planets in a one-way relationship, and nothing the planets ever do could change that. No escaped gases from Jupiter would ever strike the Sun. Nothing Jupiter does can affect the Sun. Jupiter is, on average, 778 million km from the Sun. 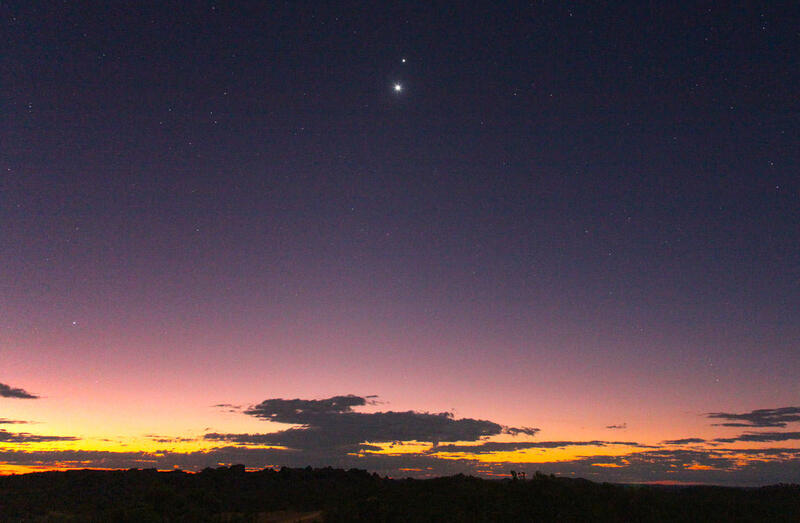 Jupiter could change places with Venus, and the Sun would keep shining normally. Jupiter could explode completely and the Sun would go on shining normally. Jupiter could put on a big red nose and some clown shoes, and the Sun would remain unaffected. The Sun is a giant atom-crushing machine 1000 times more massive than Jupiter. The massive wall of energy and solar wind that comes from the Sun slams into Jupiter, and completely overwhelms anything Jupiter can do to the Sun. It’s just the way it is. It’s just the way it will always be. Like the faked Moon landing hoax, and the Nibiru/Planet X hoax, this 15 days of darkness meme just keeps coming around. There may be no end to it. It’s annoying, for sure, but maybe there’s a silver lining. Maybe some people reading about this supposed calamity will enter the word “conjunction” into a search engine, and begin their own personal journey of learning how the universe works. We can hope so, can’t we? PabloHQQ …….. suns surface temp is about 5700 Kelvin degrees which is aprox, 10,000 degrees fahrenheit. His point was Kelvin is not measured in degrees… it’s measured in “Kelvin”. That’s it. No “degrees” involved. Common but annoying error. Of course, if it was like the article title reads, “15 Days of Darkness in November”, I would say it is true. Twelve plus hours of dark per night, multiplied by thirty days in November, then divided by 24, equals more than fifteen days of darkness..
Just to say, you can link to websites like that via archive.org, link to the cached version of their site. That way they get no link back credit in google searches, but the readers can see what the story said. Actually this is the first Ive heard of this supposed days of darkness. And I patronize You Tube! But have read that interpretations of solar weather propose heavy helium baths for Earth this November.